Rabbi A.D. Motzen, Rabbi Chaim Dovid Zwiebel, Rabbi Ahron Levitansky, Rabbi Meir Bulman. 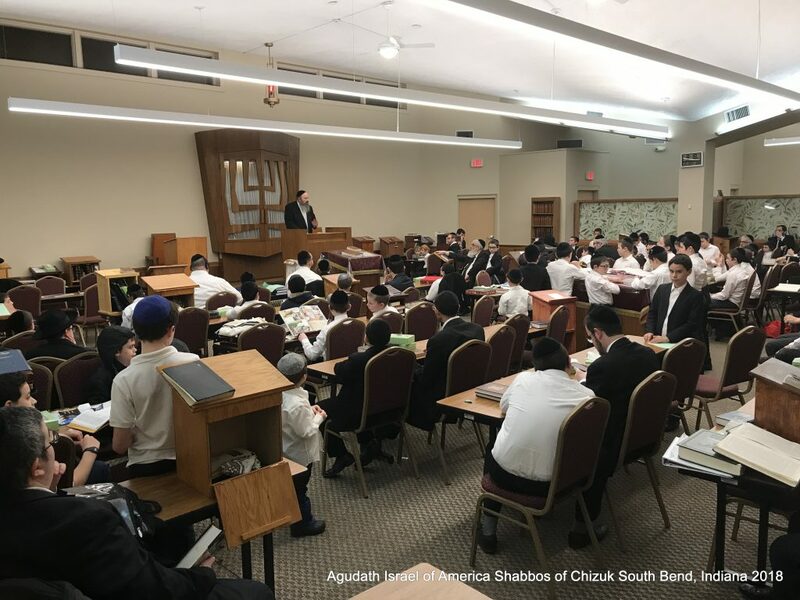 Friday morning began with Rabbi Zweibel’s visit to Yeshiva Gedola of South Bend to speak to the high school boys, encourage them, and participate in their learning. He then visited Bais Yaakov High School of Indiana explaining what Agudas Yisroel stands for and that they strive to meet the needs of Klal Yisroel wherever and whenever. 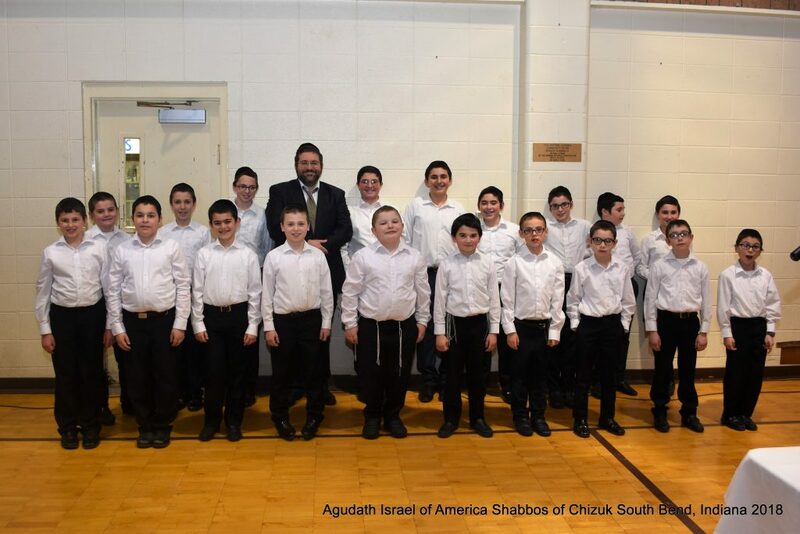 Rabbi Zweibel also visited the South Bend Hebrew Day School and after enjoying a tour with the principal, Rabbi Feivi Arnstein, spoke to the middle school boys with uplifting words of chizuk. Throughout Shabbos, the community had multiple opportunities to hear speakers address the theme of “Striving for Greatness.” Despite the frigid and snowy weather, close to 60 people attended a Friday night oneg hosted by Rabbi Shragi and Rivky Lerman. Rabbi Levitansky, Rabbi Zwiebel, and Rabbi Meir Bulman, Rav of Hebrew Orthodox Congregation, spoke movingly about the theme of the Shabbos, encouraging the community as a whole and as individuals to aspire greater heights of kedusha. Shabbos morning, the Rabbonim spoke at local shuls, inspiring their audience at each venue. On Shabbos afternoon, the women of South Bend gathered at the home of Ted and Razel Lerman for Shalosh Seudos and to hear a shiur from Rebbetzin Rivka Levitansky, – renowned speaker, educator and parenting instructor – on the topic of speech, encouraging the women to be especially sensitive when speaking to others. The men ate Shalosh Seudos at Hebrew Orthodox and enjoyed another shiur by Rabbi Levitansky. Motzoei Shabbos, after another lively session of Avos Ubanim which included the esteemed guests and a short shiur for the boys by Rabbi Levitansky, a gala Melaveh Malka was held for the entire community. Close to 200 people attended the elegant and delicious Melaveh Malka, which included a beautiful performance by the South Bend Boys Choir. Rabbi Bulman described in detail the strong and crucial relationship the frum community in South Bend has with Agudath Israel of America. Rabbi Levitansky spoke about the remarkable growth he has personally witnessed in the South Bend Orthodox community and encouraged everyone to strengthen themselves in their personal and communal avodah. Boys Enjoy Motzaei Shabbos Learning. In introducing Rabbi Motzen, Mr. Mike Lerman described how he has personally watched Agudath Israel’s involvement advocating for Indiana’s scholarship tax credit and voucher programs which together generated $850,000 in scholarships for South Bend Hebrew Day School families this year. Rabbi Motzen described how Agudath Israel was just one part of a larger effort which succeeded because of the help of many people including members of the South Bend community. He emphasized that one way for people to play a role in these accomplishments is to become an Agudah member. He explained that legislators want to know how many members an organization has and the more voters it represents, the more powerful that organization (and the community it represents) becomes. Rabbi Zwiebel ended the evening with a keynote address, pointing out that this Shabbos of Chizuk was meant to be encouraging to the community, when, in fact, he was the one going home with tremendous chizuk by experiencing the vibrancy of Torah life in South Bend. He drew an interesting parallel to the Parsha, Parshas Yisro. Yisro had to see Klal Yisrael for himself to truly believe the miracles and the greatness that they had experienced. Likewise, Rabbi Zwiebel explained with deep emotion, how he had to come all the way to South Bend, Indiana, to truly understand and realize the beauty and strength of the frum community. He spoke words of chizuk insisting that what he experienced over the weekend proved to him that the community in South Bend was a pulsating place of Torah. 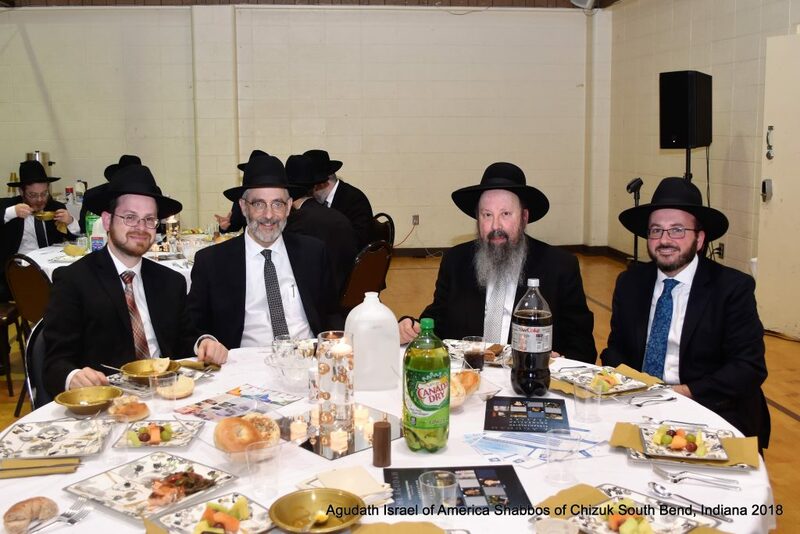 Rabbi Zwiebel said that the founders of Agudas Yisroel more than 100 years ago envisioned a movement that would unite all types of Jews in all geographic areas. 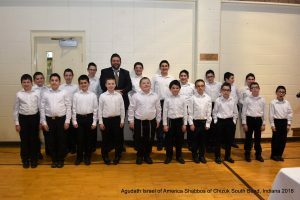 A Shabbos of Chizuk in a community like South Bend is a fulfillment of that dream.